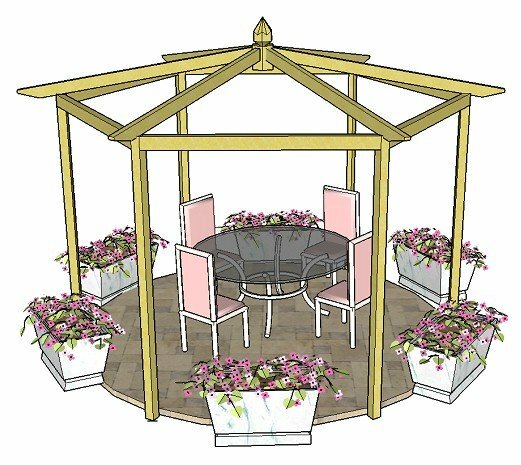 This arbour pergola plan can be used to create several wonderful garden structures: in fact, it can be anything you want it to be! With trellis panels at the sides, it forms a beautiful walkway or arch. Here the rafters are 'raised', giving an attractive appearance when the sun casts a shadow on the main rafter, but the rafters could also be flush fitting or un-notched (all explained in the plans). The length and width of the arch can be easily modified, along with the direction of the rafters, even making it into a larger pergola. All this is explained in 'Adapting The Plans' (contained within the plans themselves). The plans still work with any modifications. Here it is as a pergola, with added purlins for a decorative effect. 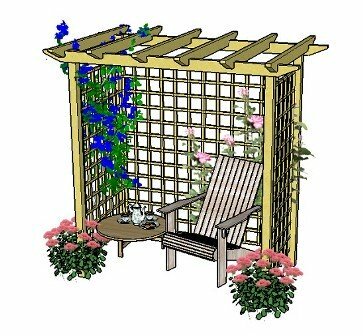 Or, with an additional trellis panel at the back, it creates a fabulous arbor under which to place a garden bench or chairs. Why not build two, or even all of them, from the arbour pergola plan; the arch, the seated arbour and larger pergola, using them in different parts of the garden! 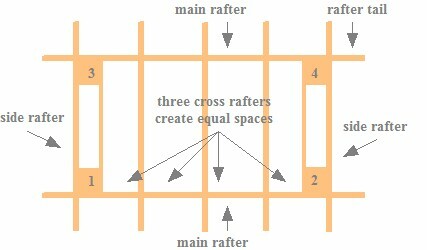 Use the same style of rafter tail end for all, to unify the whole. There are 18 different design templates to choose from. These pergolas are, indeed, very beautiful features in their own right, adding height and interest to any outdoor space. 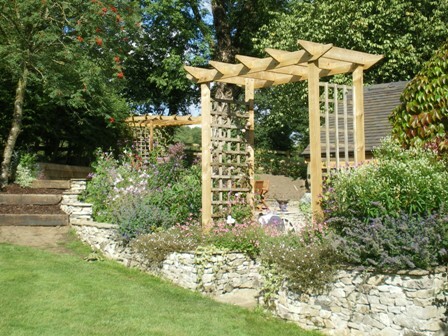 The pergola arch can be used to section off parts of the garden, where it is used as a focal point to lead the eye through to the next area, providing an element of surprise and 'journey', which is so important for adding interest to a garden. The picture shows the arch leading through from the lawned area to the sunken patio area. It was built within two raised beds, on either side of the steps. The raised beds have been planted in a beautiful cottage garden style, and the climbing plants are beginning to grow up the trellis. Here is the view as you walk through the arch. How lovely is that?! Like the beautiful water feature here, try to have some sort of focal point as you pass through. An arbour pergola, on the other hand, provides a cosy retreat in which to while away the hours, and can be enhanced in many ways by the addition of garden furniture sets, seats, cushions, throws, lights, fragrance burners and all manner of accessories. Many are drawn, on the one hand, to its secluded peacefulness, others to gatherings for intimate chats, or warm, lazy days relaxing under its welcoming and cosy protection. Mmm...sounds lovely! 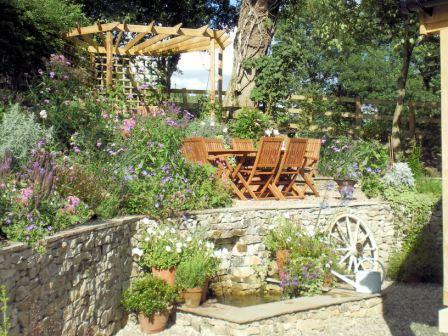 The pergola, arch and arbour all add height to the garden, which can have quite a dramatic effect. A client recently said to me, as soon as she had seen both pergolas built, "...But the garden looks so much bigger!" And, of course, it did, because, from the top of the pergolas, across the whole garden, all the air space between had now effectively become theirs. So, rather than looking down on the garden, they were now standing within their newly created garden room! By adding height you are claiming all that air space as your own. The best part, however, is when beautiful climbing plants are added for their wonderful colour, form and fragrance. What a show! This one has been newly built and is ready to plant up. 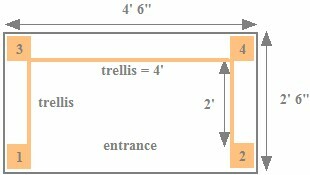 So, is it possible to build this pergola yourself? Definitely! The arbour pergola plan covers everything that you need to know to get things just right: what tools and materials you will need and how to source them: simple, yet detailed diagrams with precise instructions on how to make sure everything is level, where to place the rafters that form the roof, how to mark and cut the notches, and much more. The added bonus is that it is much cheaper to build your own than to have someone build it for you, and it is so satisfying when it is all finished and you stand back to admire your own creation. And then you have the fun of adding plants and accessories. Pergola Arch around £135, taking into account the price of the posts, post anchors, trellis, rafters, screws, bolts and washers. Arbour Pergola about £150, using an extra 4' x 6' trellis panel for the back. To have it built would probably cost about £300 - £400, if not considerably more, depending on the contractor's rates. This footprint shows the pergola arch, which has two trellis panels running down the sides between posts 1 to 3, and 2 to 4. The footprint, of course, can be made any size to suit. The arbour pergola plan is very easy to adapt. 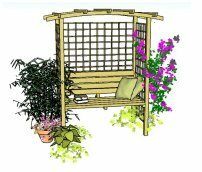 Another trellis panel is simply added to the back between posts 3 to 4, to make a cosy seating area. 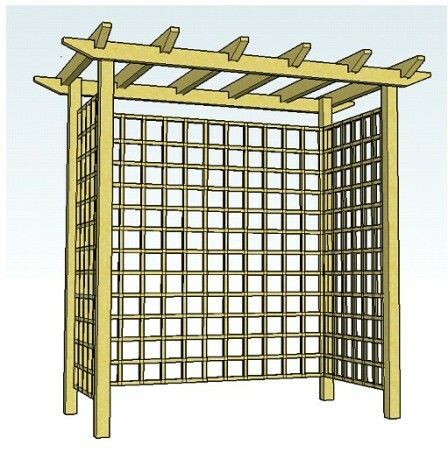 The arbour pergola plan shows how to position the posts so that the arbor pergola trellis fits perfectly. Adapting the plans, to give a truly unique structure, is also easy, and detailed instructions are given on how you might do this. The pergola shown was built as a bespoke structure for a client. It was built within two raised beds, joining the patio areas with the lawn at the side. It shows how adjustments can be made for unusual situations. 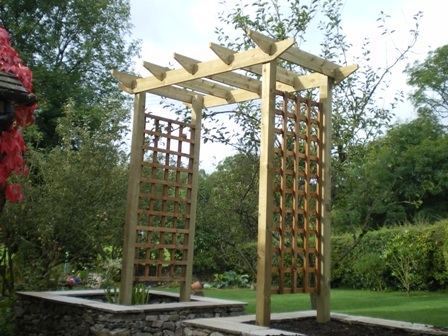 However, there is a comprehensive section showing how the arbour pergola plans can be adapted for your particular situation, particularly if you wish to make your pergola wider or longer, or if you wish to use different timber sizes. This particular pergola had trellis only on two sides. You can have trellis wherever you wish - or simply have none at all, letting the beautiful climbing plants climb up the posts. If you fancy a wooden swing seat hanging from the rafters, creating a swinging arbour, make sure both posts and rafters are sturdy enough. Here is one that is ready-made and just needs hanging! So - why will these pergola plans be great for you? Included are 18 free pergola rafter tail design templates that you can print out and use straight away. 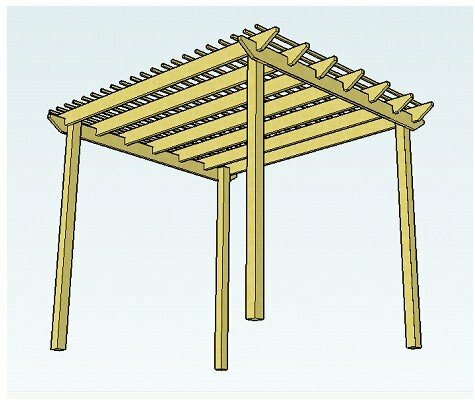 They fit the timber sizes of this pergola design and show how to create and incorporate the raised rafter style. You will be able to create a unique and stunning structure that will have a real Wow! factor. 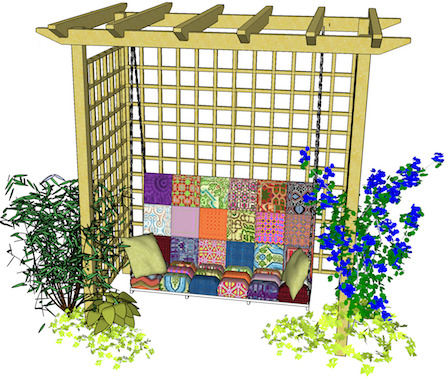 Have the arbour pergola plan immediately downloaded, ready to use. 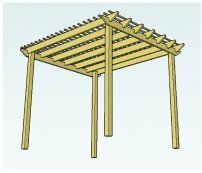 The step-by-step arbour pergola plan, which will guide you through every stage of building these wonderful pergolas. A FREE bonus of 18 different rafter tail templates, to fit the size of these particular rafters, ready for you to print out and use. If you would like to contact me for further information about the pergola arch or arbor pergola plan, please use the contact form. I always love to hear from anyone who has made a pergola from one of the plans, so if you feel like sharing your achievement, just fill in the feedback form, or have your own page on this website, telling your pergola story and sharing a picture or two. Let us all know how you got on! Here’s to you and your wonderful pergola.